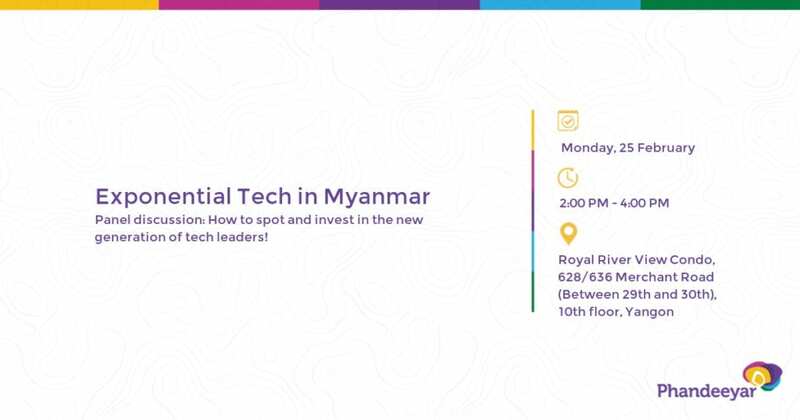 Home » Events » Exponential Tech in Myanmar – How to spot and invest in the new generation of tech leaders! Exponential Tech in Myanmar – How to spot and invest in the new generation of tech leaders! Myanmar’s technology ecosystem has evolved enormously since the reform of the country’s telecommunications sector in 2014. The opportunity for a new generation of entrepreneurs to build Myanmar’s future leading tech-driven businesses is immense. The last few years has seen a rise in investments in promising new tech startups, but what will the next few years of the digital leapfrog look like? How do you spot future winners in Myanmar’s tech landscape, and what resources and support is required for tech entrepreneurs to succeed? Join us at Phandeeyar as we invite some of the top thought leaders in our community to discuss during a curated panel discussion. This will also be a great opportunity to meet and interact with investors, ecosystem builders and other tech movers and shakers from Myanmar and beyond.